Under Live LoRaWAN frame logs PANEL … can you see the downlink frame… under RX/TX parameters ??? … and what keys do you see under downlink>txInfo ??? Question #1: Can I assume the gateway has transmitted the message i generated when I see the following mqtt message published by the gateway? Question #2: Can I considered the lora node acknowledge the receive of the message transmitted by the gateway with the following mqtt message published? No, it only indicates that the message was sent to the gateway, not by the gateway. When using the latest packet-forwarder, you will see an gateway/b827ebfffe958375/ack message, this indicates that the message was acknowledged for transmission (which could be in the future). When you receive a message on application/2/node/0004a30b001b5bd8/ack it means a confirmed downlink message was acknowledged (edit) by the device. When you receive a message on application/2/node/0004a30b001b5bd8/ack it means a confirmed downlink message was acknowledged. the downlink message was acknowledged by the lora node? I am currently testing some devices on our LoraServer setup. More specifically, I am testing an pulse meter by SensingLabs. The device is working just fine and I can successfully receive messages from it. However I need to reset to 0 the current index of the device and, in order to do so, I have to send a downlink with the following bytes to reset it. Based on what I have read, in order to send this to the device I have to encode it in base64 (AgQAAAAA) and send it via an MQTT client right? I checked the users guide of the device and the fPort to downlink is “2" and I have tried both confirmed and unconfirmed downlinks. I can’t even see the downlinks in the frame logs and I am supposed to receive an uplink confirming the reset. Also tried to enable Class-B and Class-C options on device profiles. I am trying to create a similar application ( node.js mqtt client application) , hiwerver i have to been facing a lot of problem connecting to the mqtt server. 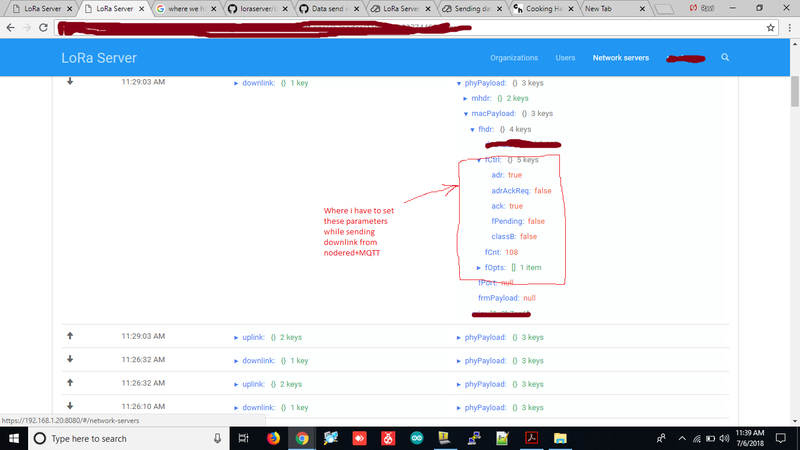 I found out that is was not possible to connect to the mqtt server directly from browser. I would like to know how u solved the problem. DId you create another socket connection to mqtt that servery your application ? first, make sure your nodejs mqtt client has no problem to subscribe to any topic published by loraserver or lora-app-server before you test the mqtt publish? i’m using https://www.npmjs.com/package/mqtt and running from console (not browser). but in lora-app-server or loraserver log nothing is printed and the message is also not added to queue.
. But it is responding to rx, join, and ack messages. I able to send downlink data using mqtt. downlink data is coming to live lorawan frame logs, and to my gateway but my mbed Lora node didn’t receive the downlink data. I am getting problem, when I am transmitting downlink from (nodered+MQTT) to the end device is not getting at end device. but when one uplink packet received automatically downlink be received at client(end device). i am not able to find where is the problem? I got problem like you. now, i still can’t solved it. if you can please tell me please.